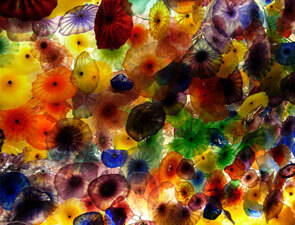 The Las Vegas Strip is four miles of spectacle, extravagance and indulgence. It's packed with casinos, sure, but there's more than slot machines in this electric paradise. For starters, there's its amazing roster of A-list performers, including Barry Manilow, Celine Dion and Howie Mandel, and shows, such as Cirque de Soleil's Beatles tribute, LOVE. 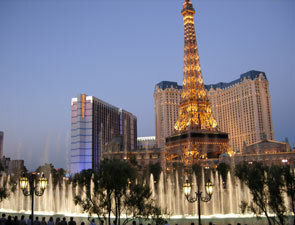 If you prefer sightseeing to show-seeing, check out the dancing fountains at the Bellagio (3600 S. Las Vegas Blvd. ), which are expertly choreographed to waltz, tango and even swing to both classical and pop favorites. Or, just north, there's the massive volcano at the Mirage (3400 S. Las Vegas Blvd. ), which erupts several times nightly, spraying fire and smoke high above the Strip. Both are free, and both are fantastic. In fact, so are a visit to the Lion Habitat at the MGM Grand (3799 S. Las Vegas Blvd.) and a stroll through historic Freemont Street (425 Fremont St.), which is vintage Vegas at its best. If you're willing to pay a minimal admission charge, check out the authentic Italian gondola rides at the Venetian (3355 S. Las Vegas Blvd. ), the amazing 1,149-foot view from the Stratosphere Tower (2000 S. Las Vegas Blvd.) or the remarkable shark reef at Mandalay Bay (3950 S. Las Vegas Blvd.). And if you're willing to adventure off the Strip, saunter east three miles to the Liberace Museum, which was founded by Mr. Showmanship himself to showcase his flamboyant jewelry, wardrobe and antiques. Even further off the Strip - 17 miles and 30 minutes east of it, in fact - is Lake Las Vegas Resort, a plush, Mediterranean style village in Henderson, Nev., that's overflowing with gorgeous mountain views, green golf courses and incredible shopping. No matter where in Sin City you are, don't forget to stop by one of the city's signature wedding chapels. Who knows, maybe Elvis himself - or one of his famous Vegas look-alikes - will stop by to see you get hitched.